With declining numbers of youth having to be detained in the local detention center, Inyo County set out to redesign its juvenile services in order to make better use of resources. The result is a proactive, collaborative program that works with youth out in the community rather than waiting for them to become part of the system. “We made a conscious decision that we were going to reinvest the cost savings we had achieved by repurposing the Juvenile Hall into services for the children,” Supervisor Jeff Griffiths explained. The County is now able to provide services and programs to twice as many area youth in a single month than were previously provided in an entire year. The Probation Department’s rehabilitation specialists work closely with the County’s Health and Human Services staff, as well as local school administrators to reach the youths in need. Students as young as fourth grade are referred by educators. In-school services include journaling, drug and alcohol prevention education, bullying prevention and other cognitive behavior programs. “We all have the same goal. We want them to grow up and be successful. We don’t want them falling through the cracks,” Rehabilitation Specialist Tabitha Warner. A key component of all of this is the strong bond the rehabilitation specialists build with the youths, who are quick to talk about the difference the program has made in their lives. In discussions with them, it’s obvious they have seen a boost in their self-esteem and now have a more optimistic outlook on the future. They are also beginning to make better choices. Peja is 14 years old; her face lights up when she discusses the relationship she has been able to develop with the rehabilitation specialists. Without this program, “I would be down in the gutter … I would be ditching school. I wouldn’t be thinking about a future that would be great for me,” she said. The youths are quick to give credit to the rehabilitation specialists for these positive changes. “It touches my heart to think that someone may have taken something I said to them and be able to use that in their future,” Warner said. The program is picking up momentum. “Kids know who we are and what we are all about. And the word gets passed on,” explained fellow Rehabilitation Specialist Alejandro Quezada. As for the previously under-utilized County’s Juvenile Center, it was converted to a special purpose facility; memorandums of agreement were entered with other rural counties in order to detain youth that need this sort of corrective treatment. Inyo County officials are hopeful their new, proactive program will keep the need for the Center’s usage to a minimum. 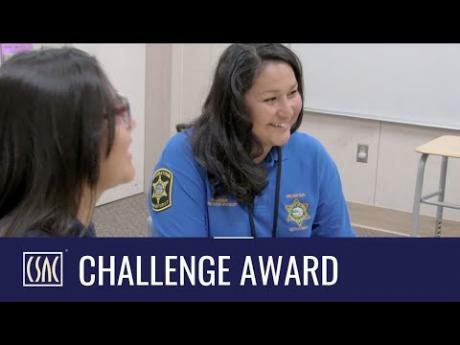 This Inyo County program is a recipient of a 2018 CSAC Challenge Award, which spotlights the most innovative programs in county government.